On this day in 1381, probably the most infamous robber baron in Germany was flogged, done in on the breaking wheel, and beheaded in Postbauer, near Nürnberg. 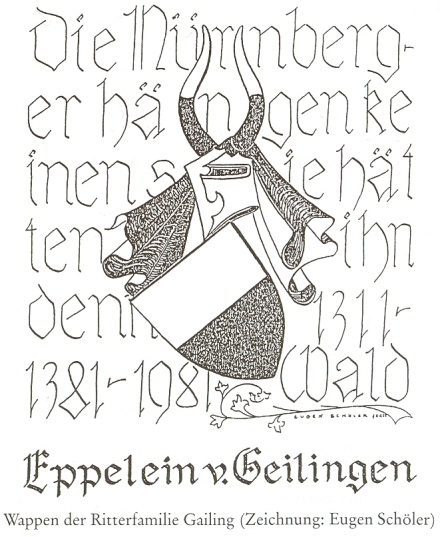 Eppelein von Gailingen (or Egkelein Geyling, or some variation thereof) has been dramatized across the ages, but little is known of the man’s life. His death, certainly, but his life is clouded in myth and folklore. What’s clear is that von Gailingen met his grisly end for robbery and a subsequent escape from incarceration. The rest is a tad murky (German link). A combination of factors led to the slow and steady dissolution of the former feudal system in favor of a money-based economy during the Middle Ages, and after the Plague swept through Europe around 1350, the accumulated changes and decimated population left much of the continent short on labor and, as a result, short on production. This really was a spot of bother for barons who, unlike their monarchical brethren, had no way to draft extra manpower. With resources thinning and a social lifestyle to keep up, many of these former lords turned to theft and exploitation. Although Rome established the rules governing tolls and trade, many local lords, now charged with obeying distant regulations, opted for a more convenient route: they stopped ships at unauthorized points, shook down the merchants, and sometimes seized wares to stock their own shelves. Eppelein von Gailingen (German link), a lord in the castle at Gunzenhausen, near Illesheim, was of this group, but apparently one of its more bold and populist members. He was often felt to be a kind of Robin Hood, and the earliest celebrations of the man were largely in this vein: a knight’s knight, fighting against an out-of-control state disregarding its people. Eppelein got away with his skulduggery until 1369, when he was captured by a political rival and imprisoned in Nürnberg. 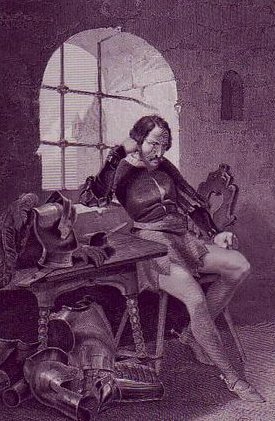 Von Gailingen was sentenced to death, but shortly before his hanging, an accomplice managed to sneak him a horse, on which he rode out the tower gates and hurdled the enclosing wall and moat. Now the leader of a loyal band of brigands flouting the Roman Catholic Church, Eppelein went on the run for six years, eventually making his way back near his home. It was there that, after six more years, his minimal forces finally yielded to the Count of Nürnberg, who carried out a much more unpleasant version of the death sentence. Eppelein’s rise to prominence began in the 16th century, when he was immortalized by a folk song, a medium that continues to be kind to him. Locals still tell a variety of tales of his exploits, and a rendition of these classics is vaguely effected through the film Ekkelins Knecht. Others have simply waxed poetic on the topic. As if all that attention weren’t enough, von Gailingen’s run from the law lives on through the legend of Nürnberg: locals pushing the town on tourists claim that two hoofprints from his daring escape are imprinted in the stonework near the the castle’s five-pointed tower. * And perhaps most indicative of his endurance as a cultural icon, a neighboring town has devoted a festival to him, which is more than most robber barons of any day can claim. * Not surprisingly, the tower was destroyed and rebuilt at least once — just five decades after Eppelein’s alleged leap. But the new sandstone structure does bear the marks of what could conceivably be a horse’s hooves.